As part of the Project for Support of the Improvement of PALOP and Timor-Leste Public Service Quality and Proximity (PASP PALOP-TL), a ceremony will be held on Thursday, February 1st at 3:00 p.m., at the National Directorate for Registration and Notary facilities, of the Ministry of Justice, in Díli, for the delivery of vehicles and equipment that will be used to issue Identity Cards. This ceremony signals the public services extension for the issuance of the Identity Card, an activity included in the Timor-Leste PASP PALOP-TL National Project budgeted at 400,000 Euros, which aims to ensure the identification of citizens and protect their personal identity in six municipalities: Aileu, Ainaro, Liquiçá, Manatuto, Viqueque and Manufahi. The ceremony will be presided by the Minister of Justice, Maria Ângela Viegas Carrascalão, and will be attended by the Ambassador for Portugal, José Pedro Machado Vieira, and the European Union Delegation Chargé d'Affaires, Alexandre Zafiriou. On this occasion, which will be witnessed by the Minister of the Presidency of the Council of Ministers, Adriano do Nascimento, the Vice Minister of Foreign Affairs and Cooperation, Adaljiza Xavier Magno, as well as the Vice Minister of Justice, Sebastiao Dias Ximenes, and representatives of other Ministries and the National Authorizing Officer of the European Fund in Timor-Leste, various equipment purchased by the Project will be formally delivered, namely two new vehicles that will be equipped with computers, scanners, printers and digital cameras and which will be used to facilitate the provision of this Public Service the Identity Card issuance to Timorese citizens in the various municipalities. On Friday, February 2nd, at 3:00 pm at the Municipal Directorate for Registration and Notary premises in Liquiçá, the formal launching of the National Project to Expand the Issuance of the Identity Card to 6 Municipalities will be held in the Municipality of Liquiçá, presided by the Minister of Justice, in a symbolic act where the first Identity Card will be issued using these means. For clarification of doubts the following should contact: Dr. Iriana Ximenes (Timor-Leste Focal Point), irianafreitasdejesusximenes@gmail.com, +67077273797. 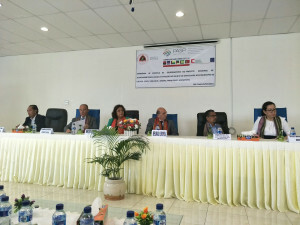 The Project for Support of the Improvement of PALOP and Timor-Leste Public Service Quality and Proximity is co-financed by the European Union (EUR 4,800,000.00) under the 10th European Development Fund and co-financed and implemented by Camões - Institute of Cooperation and Language, IP (EUR 1,000,000.00). Technical supervision of the project is provided by the Agency for Administrative Modernization, I.P. (AMA, I.P.). In Timor-Leste, the strategic partner for the implementation of the PASP is the National Directorate for Registration and Notary of the Ministry of Justice. In the remaining partner countries the partners are INFOSI (Angola), NOSi (Cape Verde), CEVATEGE (Guinea Bissau), INTIC (Mozambique) and INIC (São Tomé and Príncipe), as well as entities responsible for the execution of national projects financed by PASP PALOP-TL.